After the drama of last week's broken needle, which was promptly replaced by Get Knitted, this week has largely focused on getting ready for the AscendancyLRP tabletop roleplay and skirmish game this coming weekend. There have also been several visits from British Gas who now apparently do annual electrical tests for Homecare customers as well as servicing gas boilers. Unfortunately, my house's wiring failed and needs a new RCD as the current one turns out to be too sensitive and is cutting out with only minor provocation. With the house's wiring being of unknown provenance and age, the fusebox is no longer in common use and so a replacement RCD is a special order... We now await the electrician's call to say its arrived. As I mentioned in my previous post, I finished the humungous doily which came to an end abruptly after several nights of working on the last row, when I suddenly ran out of doily to crochet. Once I'd bound off it looked fairly impressive, but I waited to take any photographs or blog it until I'd had a chance to block it. On Sunday morning, with the weather dry if rather grey and non-descript I thought maybe I could dry it outside and so I decided to have a go. The Between Meals Centerpiece (Ravelry Link) doily is huge and is a combination of fairly dense crochet bands with openwork in between. I tackled the pinning by starting with the centre circle, then moving onto the middle circle, stretching the damp cotton out as I went. I placed the pins at wide intervals and then went around again placing pins between pins, so I evened out the tension. I put in another row of pins just inside the border, ending up with pins every two inches or so. The final row of pins stretched out the border. Once I was done, I got Dave to help me carry the whole thing outside very carefully so the foam tiles didn't come apart. We left the doily sat on the bins to catch what sun there was, bringing it in again at dusk and laying it on the floor overnight to make sure it was absolutely dry before I removed the pins. We did try propping the doily, still pinned to the mats up against a wall (something I've heard of folks doing on Ravelry) but while that looked promising initially, it didn't prove to be cat proof. 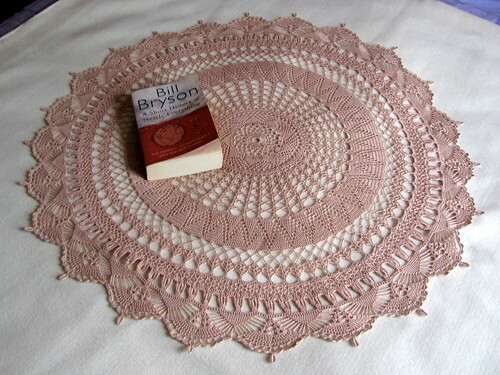 The instant Charlie came in, he made a beeline for the huge doily and spotted the tiny gap between doily and wall. As I'm sure everyone knows, any tiny gap is always improved by the addition of a cat and Charlie is a cat who has no appreciation for the size difference between tiny and a rather large tom. He has wriggle power and a big head, a combination that has always worked well for him. Fortunately, I saw the cat dart over the doily; was already moving as I saw him stick his head down the side of the mat made up of foam squares and caught the doily before anything catastrophic happened. Phew! I give you my version of the Between Meals Centrepiece an original pattern from 1917. I managed to find it again on Annie's Attic, despite it having disappeared the last time I looked. There may be other sites out there that are hosting it if you hunt about. My Between Meals Centrepiece was crocheted with Clea from Circulo Yarns, shell beige or colourway 7650. I used a 2mm hook because I'm a tight crocheter which gave me a final diameter of 32.5 inches or 83cm, which isn't far off the expected 30 inches reported on Ravelry. I didn't block this one to death, but I did stretch it out to dry although tension was minimal. 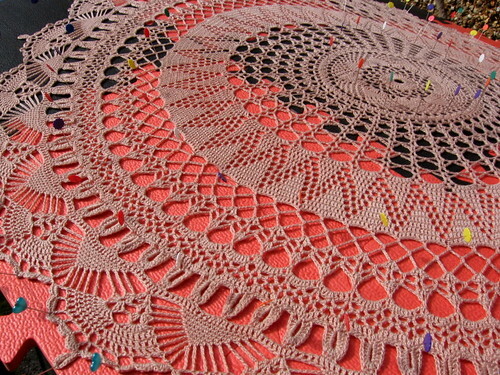 Before blocking the Clea looked a lot more springy whereas after, it looks exactly like a huge doily should. This is my first ever go at a doily and I deliberately picked the BMC because it was challenging but it really doesn't contain anything too difficult in the way of stitches. If you can follow American notation (rather than UK), can make a chain, slip stitch, single crochet, double crochet and treble treble (or is it triple triple in American?) 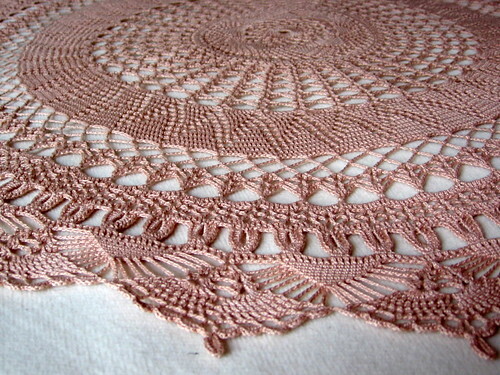 you can make this doily. The most difficult thing is the need for perseverance as it takes a long time and those last few inches take forever, with time seeming to slow to a crawl. The one drawback to the pattern is that it isn't charted, so if you need charts to work this kind of pattern you'll need to make one yourself. Fortunately for me, I'm not dependent on charts although I prefer to work with both so I can compare from written instructions to chart if I need clarification. However, there were moments when I certainly wished I did have a chart as it wasn't always easy to understand what the written instructions were trying to tell me to do. There are also a couple of minor mistakes in the pattern, where the stitch counts don't work out and I had to fudge things a little. Silly me though, because I didn't note them down I just sort of got on with it... 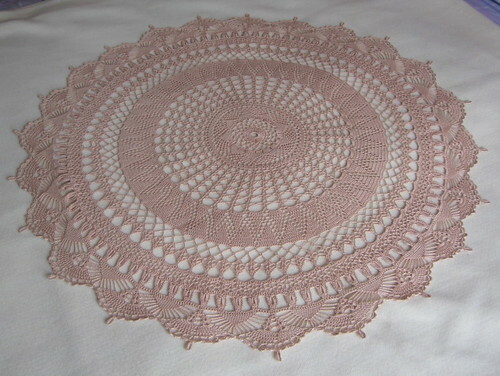 The other thing I'd advise when making up this doily is to read ahead. Understanding what you'll be expected to crochet into the row you're working is essential as is keeping an eye on the tension, otherwise you could find that you get to an end of a round and can't actually crochet the next row into this one, because you can't get the hook through the tiny, tiny little loops. 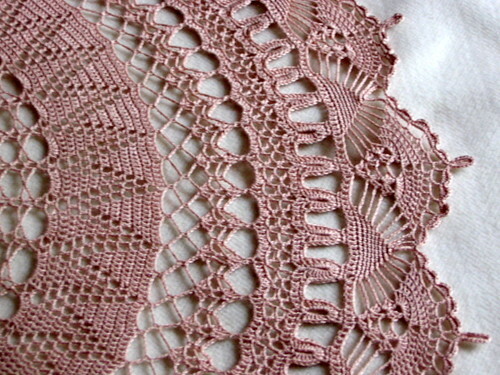 Overall, I really enjoyed making this doily although I still claim I do not have the lifestyle that supports the use of such frivolous pieces of lace. It took me two months, but I was working on other projects alongside it. I didn't get bored or lose heart and found the whole thing a fascinating experience. This is the first time I've worked something on so tiny a hook and that did give me tension issues at first, but over time I got the hang of it. 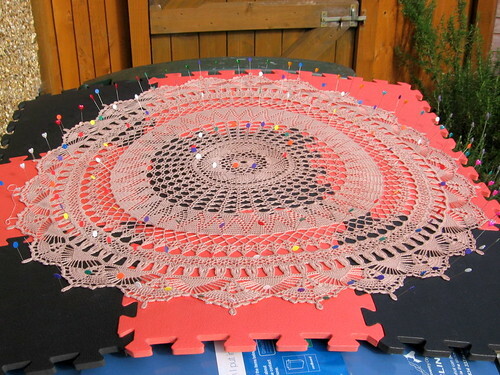 Even though I have nowhere in my tiny house to display such things, I may well have to make another doily or two, just to prove it wasn't a fluke. wow... that is gorgeous... I don't know how to crochet.. I never tried, but this is fantastic. Wonderful! I especially like the textures in the close-up shots! Really looks good, you do need to find somewhere/way to display it. 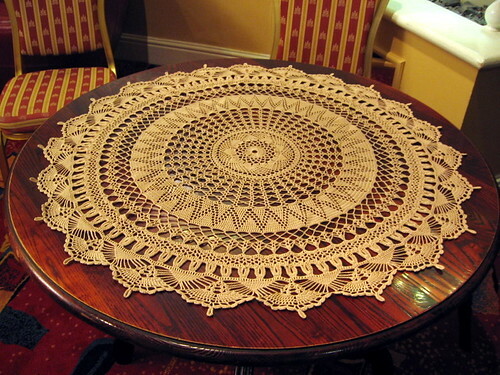 That is stunning, congratulations on finishing your doily, it does look very beautiful. It's massive and brilliant, well done you! Fantabulous !! I keep thinking of trying a doily and you are certainly encouraging me to try. though I am tempted to try the mad 3d Swan one I found recently. I think I linked in in Ravelry if you want to look.